Some species of insects are at "very low numbers" in the UK after months of wet and cool weather, experts say. 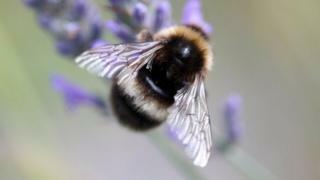 The Buglife conservation charity says the recent period of damp weather has seen the numbers of bees, wasps, moths and butterflies shrink in 2012. Its chief executive Matt Shardlow said that if the country keeps on having periods of damp weather, then it could prove dangerous for some rare species. "They might not recover and could be driven closer to extinction," he said. This year saw the wettest April-June quarter on record and further heavy rain in July. Mr Shardlow said the damp conditions have resulted in fewer aphids for wasps to feed on, which has reduced their numbers. It is likely to take two more years for their numbers to recover, he added. He also said the approximately 250 species of bees in the UK need high temperatures to gather nectar and pollen. "We are seeing very low numbers of them now, as well as small bumble bees, which is a sign they haven't had enough nectar and pollen to feed on." Buglife says there is no specific data collated on various insect numbers, but that its volunteers and experts have been spotting numbers and will detect "massive year-on-year variation" which they have reported this year. However, some data is collated on butterfly numbers, and Mr Shardlow says that this year could see the lowest number of that insect ever recorded in the UK. Moths, too, are being seen in fewer numbers, he said. However, the wet weather has been good news for some insects, such as the crane fly, drone fly and mosquitoes as well as molluscs such as slugs and snails, which all thrive in the damp conditions. "This means that anything which feeds on slugs and snails will also benefit this year," Mr Shardlow said. "We've had reports of large numbers of glow worms, for example, which feed on slugs and snails." But Richard Ridler, chairman of Essex Beekeepers' Association, says this year's bad weather has not necessarily killed off bees, just stopped them from venturing out into fields and gardens. "The problem was that we had an appalling start to the year, which meant the bees stayed at home. Instead of going out, they stayed in their hives and ate their honey. I've had 25% of the honey yield that I would have expected this year. "So the public saw a lot less of them. I haven't had beekeepers telling me that they've lost more bees than usual. "This has been the most unusual, bizarre beekeeping year because of the weather. Most beekeepers I've spoken to have written this year off as an interesting experience, and one they hope not to have again for a while." Has the sniffer dog had its day?